The Sea Squirt: An Answer to Alzheimer’s? The newest breakthrough in Alzheimer’s research is coming from an unlikely source–a sea squirt. Just this week (March 2, 2010) Mike Virata and Bob Zeller of San Diego State University believe that Ciona intestinalis, known commonly as the sea squirt, may be the perfect model organism for this disease. The brains of Alzheimer’s patients are typically filled with tangles and plaques made of the protein fragment beta-amyloid. Alzheimer’s disease affects nearly 4 million Americans and an estimated 27 million people worldwide. It is the most common form of age-related dementia and has no cure. Current drug regimens only relieve symptoms and cannot halt the progression of the disease. Research in the scientific community is currently aimed at slowing the disease through drugs such as Aricept and Namenda which are focused on decreasing plaque accumulation. Recently, research has shown the need for an improved model organism to aid in understanding the pathology of the disease. Currently, genetically modified strains of mice have been the organism of choice in the research of this disease. However, there are limitations in the use of mice including an extremely long waiting period for plaque development like those seen in Alzheimer’s brains. Also, these mice do not contain the same genetic mutations linked to hereditary risk of Alzheimer’s disease. Mice are also more costly to purchase and maintain for research. 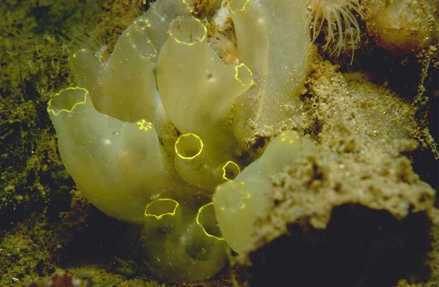 Sea squirts are tunicates, marine organisms with a hard outer tunic and a soft body. They live on underwater structures and are filter feeders that eat small plant material. 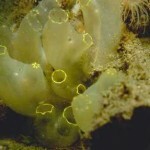 It has been suggested that sea squirts are actually our closest invertebrate relatives. As far as research benefits, sea squirts share nearly 80% of our genes and resemble vertebrates in their immature form. These animals are inexpensive to house and contain all of the genes needed for the development of Alzheimer’s plaques in humans. Virata and Zeller found that by giving the immature sea squirt amyloid precursor protein, a mutant protein linked to hereditary Alzheimer’s, sea squirts developed brain plaques in a single day. Further, these plaques and the behavioral deficits seen in these animals were able to be reversed using a drug meant to remove plaques. Such techniques have been ineffective in all other invertebrate models, including the commonly used nematode, C. elegans. Now, investigators can be freed from genetic, time, and financial constraints. These findings provide a resource for an entirely new take on Alzheimer’s research…all because of a sea squirt. This is fix setup for the know about the all deep technical things fix connections for bluetooth audio devices and wireless displays in windows 10 basically here you have the chance for the interactions and helps also.